British lecturer and author Philip Mansel drew a colourful and diverse picture of three Levantine cities that represent centres of wealth, freedom and joy at the crossroads of East and West - Alexandria, Beirut and Smyrna (Izmir) - in a lecture on Wednesday. 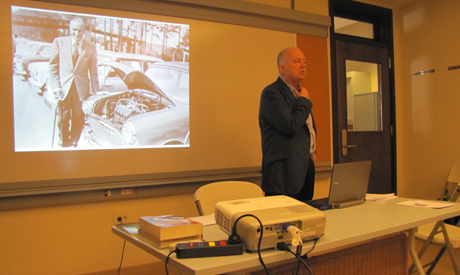 Mansel delivered a lecture at the American University in Cairo entitled ‘Levantine cities: The Past for the Future?’ capturing the attention of his audience for over an hour, mesmerising them with rare photos of the old cityscapes that have now almost vanished on account of time, war and the changes inherent in globalisation. Mansel tracked the history of the three Levantine coastal cities from the early alliance between the French and the Ottoman Empire in the 16th century to the middle of the 20th century, and in doing so, he presented a different story of these cities from the normal dry academic history. The story of the rise and fall of these three ports is a long history that ends in catastrophe. Two of those great cities of the Levant (Beirut and Smyrne) ended up partially destroyed. The great fire of Smyrna in 1922 left the city completely ruined. According to Mansel, some stories say that even people in the mountains of Greece, across the Aegean Sea from the city, were able to see the fire. Beirut was also destroyed by a French occupation that left Lebanon divided by devastating sectarian strife. Only Alexandria entered the 20th century without suffering from similar catastrophe. Yet even Alexandria lost its cosmopolitan nature and was exposed to what Mansel calls “Egyptianisation,” becoming more and more like other Egyptian cities, its demographic formation changing and the number of foreigners decreasing. The author of ‘Levant: Splendour and Catastrophe on the Mediterranean’ argued that the cities of the Levant were never closed cultural ghettos but rather melting pots that contained many different cultures from Europe and the Mediterranean. According to Mansel, the people at these three ports showed a rare ability to learn new languages and to switch between identities. For instance, Smyrna had more than 10 common languages including Arabic, Turkish and French. The impact of French, the language of business, is evident in its modern Turkish; over 5,000 French words entered the Turkish language, according to Mansel. “We think of identity in a fixed way, but we all have many different identities that vary and differ. The inhabitants of the Levantine cities freely switched between their different identities. Muslims, Christians and Jews were able to live together in a great harmony. Tolerance was the general rule in the Levant at the time Europe was excluding Jews. It was legal to build a synagogue beside a mosque or a church [in the Levant],” said Mansel. The author of ‘Louis XVIII’ also discussed the commercial features of the three cities, which were well integrated into the European economic system and connected to the wealth centres of the ancient world. Alexandria was the third port in the Mediterranean and its bourse was the largest stock exchange outside Europe. Smyrna was one of the biggest ports in the Levant at that time. According to Mansel, Hong Kong and Dubai play this role in the current period. The three cities flourished and were a great example of cosmopolitan culture, with foreign schools and universities like Victoria College in Alexandria and the American University in Beirut playing a major role in the modernisation of the cities. But the cities have another common feature, according to Mansel: vulnerability. Mansel described the Levantine sea ports cities as Titanics heading to catastrophe, as the golden age of cosmopolitanism in all three cities ended dramatically. The great fire raged for nine days in Smyrna, leaving only ashes. Beirut was lacerated by civil war. Alexandria was bombarded by the British for three days in 1882, and burned for another three days. The city was not destroyed, but its cosmopolitan nature and remarkable architecture was not to last.